This is the video we shot at Hangla's for The Finely Chopped. What is it that migrants miss the most when they leave their home town? When I left Kolkata for Mumbai 16 years back I would often go to the PR desk of my office in Bombay and read The Statesman and The Telegraph. Newspapers from Kolkata. This made me feel in touch with home. My first Durga Puja in Mumbai was when it hit me how much I missed all that I had left behind and for many years after that I headed to Kolkata for the pujas. Till I had a family in Mumbai. What I missed most when I shifted though has to be the food. I missed my daily fish, which I never considered special in Kolkata, as I lived in a PG run by a vegetarian family in Mumbai where even eggs wee not allowed. I missed Bengali food but found a cheap option for it in the New Bengal Hotel terrace mess which is no longer open unfortunately. Only Fish, which became Oh Calcutta, was too expensive for regular visits on a trainee's salary. Places like Bhojohori Manna and Calcutta Club now plug the gap for budget Bengali food in Mumbai. Then we rented an apartment, got a tiny kitchen and I began cooking Bengali food at home. What I didn't have access to for years in Mumbai was the street food of Kolkata. I missed the roll the most as that was staple for me in Kolkata. 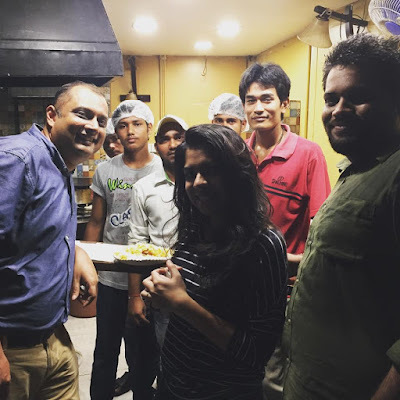 I went to a place called Bheema at Andheri for rolls but wasn't too impressed. For a while Bandra had the now shut Chowringhee Square. The rolls there were too, as we used to say in Kolkata, 'sophi'. Fry it in more oil, I would tell them. Oh Calcutta served nice rolls in a Calcutta Street Food festival in the restaurant but that was a one off event. Then Hangla's was opened by Soumitra Ghosh, a Bengali photo journalist, at Lokhandwala in Mumbai. I tried the rolls there and loved them. They opened at Bandra too, opposite Amarson's, and this stall became my go to place for rolls. I have the egg rolls there which I grew up on in in Kolkata. Though I eat the mutton roll more often now. I don't like the chicken roll at Hangla's but the mutton and egg rolls at Bandra have been consistently good. Close to Kolkata quality though at Mumbai prices (3 to 4 times that of Kolkata). I have tried rolls in other places that came up. Feast@eaast, Bong Bong and the now shut Boda, Lazeez and Arsalan. I found Hanga's at Bandra to be the best in terms of the quality of the paratha, the right balance of the spicing, the way they kebabs in the mutton rolls are cooked, their willingness to fry the onions for me and the fact that they don't put in sauces. You could say that the rolls Hangla's is one of the reasons why I don't miss Kolkata that much. Though I would always jump at the opportunity to head back for a roll at Nizam's or Kusum's or Badshah in Kolkata. They make a decent Kolkata biryani too at Hangla's. This was my last shoot with our producer at Ping, Nikeet Shivalkar, before he moved on. Wish him all the best and really enjoyed working with him.